Made of 100% preshrunk heavyweight cotton, this 6.1 oz. custom t-shirt is a walking billboard for your company logo, school team or upcoming event. These classic lightweight cotton custom t-shirts are perfect for your next event or promotions! No matter what your adventure is for the day, make these Clique Ice Tee custom t-shirts your go to choice when you are out and about. Step out in style when you start your daily adventures with these Clique Ice Tee custom t-shirts imprinted with your custom logo. 100% ComfortSoft cotton Hanes custom t-shirt offers a comfortable and tagless logo t-shirt. A year-round essential, our best-selling custom t-shirt has been voted "most popular" by groups, teams, clubs and schools across America. Update your promotional apparel options with these Port & Company v-neck custom t-shirts imprinted with your customized logo. 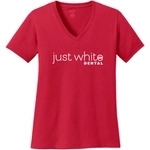 Make these casual and comfortable v-neck custom t-shirts part of your wardrobe essentials for your promotional apparel. This colored Delta Dri-Performance Custom T-Shirt is moisture wicking, making it perfect for sports teams or gyms! It's also anti-microbial treated to help control odor. Bring style, performance and quality to your branded promotional apparel with these tultex fine jersey custom t-shirts imprinted with your full color logo. Popular brand name with the best quality, 100% ring spun cotton logo T-shirt in dark colors. 6.1 oz. Grab this name brand Hanes custom t-shirt for that classic look that goes great with any logo. A 100% cotton logo t-shirt that is ring-spun for added softness. This colored Delta Pro Weight Custom T-Shirt is made of 100% pre-shrunk cotton and is very soft and comfortable. With so many colors to choose from, there is sure to be one that will highlight your logo! Stay warm in cool weather in this colored Delta Dri-Performance Long Sleeve Custom T-Shirt. It's the perfect shirt to customize for activities in the spring or fall! This colored Delta Magnum Weight Custom T-Shirt is so comfortable and made from 100% pre-shrunk cotton! Add your branding, team name, or design to create a unique shirt that will stand the test of time. Stay stylish while your brand stays hot with these great Comfort Colors rungspun garment dyed custom t-shirts. When you look good, you feel good, and you certainly play good when you and your team are wearing this Team 365 V-neck custom sport jersey imprinted with your company name. Associate your brand with style and comfort with these great Comfort Colors rungspun garment dyed custom t-shirts. These lightweight cotton custom t-shirts are available in a wide variety of colors, making them perfect for your next event or promotions! Take your brand to a whole new level of recognition with these all over sublimated digital camo print crew neck custom t-shirts. Looking stylish is as important as being comfortable, and with these tultex fine jersey custom t-shirts imprinted with your logo, you and your recipients will. A preshrunk custom t-shirt that is a perfect fit for your company logo. This custom tank top is the perfect layering piece for daytime or as a sleepwear top. This colored Port & Company Fan Favorite Custom Tee is definitely a comfy and fashionable piece. It is made from 100% ringspun cotton. Choose from the long list of colors! These fine jersey customized t-shirts have a tubular design and a durable rib neckband.